The Spring View Select 6609CT Mobile Home Floor Plan offers 1,144 square feet of living space. 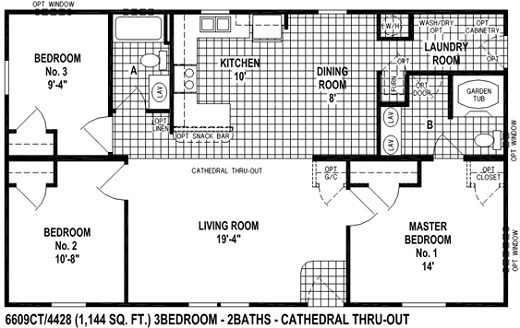 It features 3 bedrooms and 2 baths but you can also convert one bedroom into a den. It has an corner shower or corner tub option. This would be a great floor-plan to build an attached garage onto the end. This floor plan, just like the rest has a lot of features built in, and you can add even more features to customize it to fit your lifestyle.